At Welcome Traveller Inn, enjoy a satisfying meal at the restaurant. Wrap up your day with a drink at the bar/lounge. For your convenience, a complimentary breakfast is served daily from 7:30 AM to 9 AM. Make yourself at home in one of the 8 guestrooms. Complimentary wireless Internet access is available to keep you connected. Conveniences include coffee/tea makers, and both irons/ironing boards and cribs/infant beds (complimentary) are available on request. When you stay at Boulston Manor in Haverfordwest, you'll be 10 minutes by car from The Creative Cafe Haverfordwest. 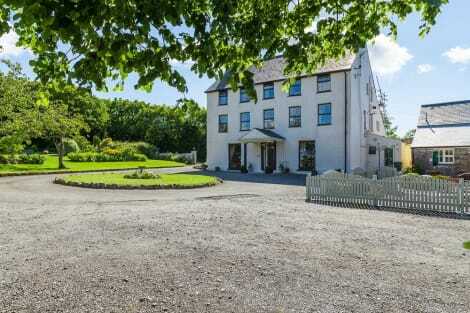 This 4-star bed & breakfast is 15.5 mi (25 km) from Pembroke Castle and 20.4 mi (32.9 km) from Tenby Beach. An ideal gateway for exploring Pembrokeshire's fantastic coastline, Haverfordwest is known for its thriving market and impressive ruined castle, and was probably inhabited as far back as the Roman period. Dating back to the early 12th century, Haverfordwest Castle was, for much of its existence, occupied by the English, and accommodated Queen Eleanor of Castile in the late 13th century. Unfortunately, after the English Civil War, the site was neglected and fell into dilapidation, although the surviving ruins are now protected by the Pembrokeshire Coast National Park Authority. Only a few miles from Haverfordwest, the Pembrokeshire Motor Museum showcases an interesting variety of vintage cars, and explores the history and evolution of motor vehicles over the years. Another popular attraction nearby is the Scolton Manor Museum and Country Park, which is housed in a beautiful Victorian house and is the perfect day out for people of all ages. This venue contains thousands of artefacts relating to the history of this former manor house, and is surrounded by a Green Flag country park. Established in 1952, the Pembrokeshire Coast National Park includes 186 miles of spectacular coastline and dozens of Sites of Special Scientific Interest. One of the most famous beaches is Barafundle Bay, which overlooks clear emerald waters and could easily win the award of Wales' most breathtaking sandy bay. Known as the 'little fortress of the fish' in Welsh (Dinbych-y-pysgod), Tenby is revered for its golden sandy beaches and painted Listed buildings. The town became a major seaside resort after it was connected to the railways in the Victorian era, and still attracts significant numbers of holidaymakers during the school summer holidays. The settlement of Wales' patron saint, St Davids became an official city in 1995, despite having a population below 2,000. The city is a popular stopping point for hikers exploring the Pembrokeshire Coast Path, and is noted for its attractive Bishops Palace and stone cathedral. One of the most romantic Haverfordwest hotels has to be Slebech Park, which is adjacent to a scenic lake and comprises a well-preserved 18th-century manor house. Another very good venue is the Premier Inn Haverfordwest (North / A40), which offers excellent value for money, while the wonderful Wolfscastle Country Hotel offers a traditional country themed experience in picturesque surroundings. For delicious British classics, visit the Nant y Coy Mill, or dine at the Welsh Spice restaurant for some divine Indian dishes. Other renowned restaurants include the eclectic-themed Georges Restaurant & Café Bar and the British-inspired Harp Inn.